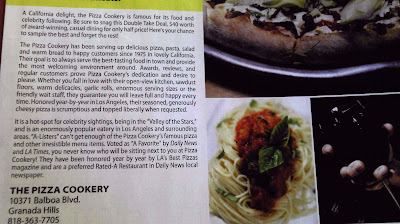 GIGA GRANADA HILLS: Really, Pizza Cookery? Really? Pizza Cookery, tell us the truth. Is Pizza Cookery really a "Hot spot for celebrity sightings" like it says in your Clipper Magazine ad? Are there really that many A-listers coming into your joint? If so, how many and which ones? If you've actually seen Angelina Jolie, Tom Cruise, or Madonna going into the Pizza Cookery to eat doughy, not-all-that-garlicky garlic rolls, readers, please let me know. Apparently, A-listers are in there all of the time. They have pictures on the wall of the celebrities that have been there--including John Travolta. Honestly, I'd hate to disparage any great business in our community. Especially one that sponsors so many sports teams. With the owner IN the photos? Trust me, the John Travolta photo isn't a paparazzi shot. Again, I'd hate to dis local business that support our community, but then again, your mileage may vary. Not 15 years ago. But then again, I like Ray and his family, and have always supported local businesses.